Visual Studio Code comes with an inbuilt Command Line Interface. Once you&apos;ve installed Visual Studio Code, and have it open, press ⇧⌘P to open the command palette for Mac, or just ⌘P and the press > button. I&apos;ve truncated the output above, but there&apos;s more to it. You can read through the commands and what they do, but you can see there are some very useful and handy tools in there. We&apos;ll look at one --diff. Ever wanted to see the difference between two files, Let&apos;s look at an example. Here are two files with a slight difference in them. This is a small file, and we can see the diff right away. But for demonstration purposes, we&apos;ll type in the following in the command line. We can see where the diff in the two files is. This is the same view that&apos;s available when you are looking at Git Diff, with the integrated Git Support in Visual Studio Code. Let&apos;s go through a simple workflow that will involve the following steps. We have the two files we created app1.js and app2.js. Let&apos;s initialize a git repository in this directory. And then open Visual Studio Code with this directory. You&apos;ll immediately notice that Git is active in the left most pane. It has a badge with 2 on it. We can now see a Staged Changes section, with the file we&apos;ve added, and the status has changed to A which represents Index Added. Now, there&apos;s a new entry in Changes section with the same file. When you click on the file app1.js in the Changes Section, you will see a diff displayed, like we saw in topic 1. You can then click on the + sign to stage the changes. Committing the file to git is as simple as typing in the commit message at the top section with the Message (Press..., and pressing CMD + Enter or Ctrl + Enter. Below, I wrote Initial Commit . Pressing CMD + Enter, changes the view back to Changes only for the files we did not add. .
A helpful Context Menu: - When you click on the menu icon ... within the Git Panel, this is what you see. Debugging is a large topic, and is usually language/stack specific. Depending on the language you are using, there are available plugins that enable support for debugging, and you&apos;ll be able to use breakpoints to debug your code when developing. Here&apos;s a Video, showing Visual Studio Code in action. If you like working on multiple open editors in the same project, you will find this feature really interesting. You can press OPT, and click on a file, or right click on a file and choose Open to the Side, to open more the file in a split view like shown below. . Peek Definition - this allows you to see the definition of a function/variable, without navigating to the it, even if it&apos;s in a different file. It works with multiple languages, though sometimes you need to install the relevant plugins. To access it, right click in the line console.log(nameAndAge()), and click on peek definition in the context menu. . VS Code will find the function, and give you an overlayed editor to peek on what&apos;s going on. You can also select Go To Definition, and you will be taken directly to where the function/variable is defined. Find All References - This works pretty similar to Peek Definition. Right click on the function nameAndAge, and select Find All References. On the right of the overlayed editor, you will see a list of all the places the function has been referenced. This is useful in giving you an overview of how much a piece of code affects your whole codebase. Rename Symbol - Also found in the context Menu, this allows you to rename a function or variable, and it will be changed everywhere it is referenced in the codebase. NPM Scripts - This sounds like it should be a feature in its own, but I&apos;ll just put it here. NPM Scripts are usually commands that we put in the scripts section of the file package.json. VS Code has a couple of helpers for NPM. First of all, when you are creating the scripts, there&apos;s beautiful intellisense and you can just select the script you want. Next, there&apos;s a NPM SCRIPTS panel on the left, usually at the bottom, which will list the package.json file, and within it the scripts. Right clicking on the file, gives you an option to run npm install . And Hovering over the particular script displays a Play button which will allow you run the script. Outline - Outline was released recently, and I can&apos;t believe how much I use it. 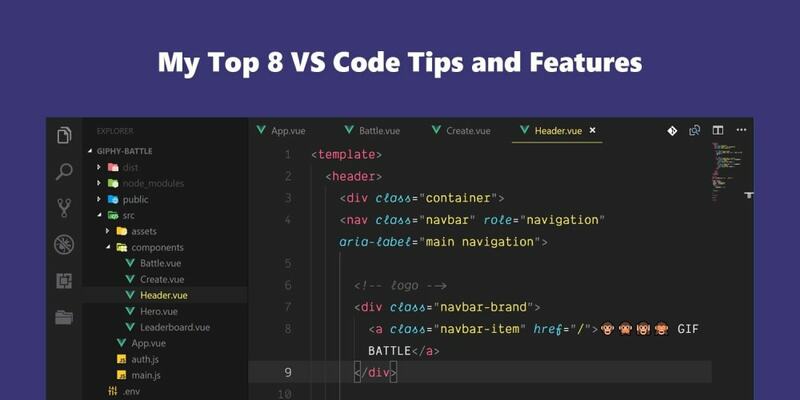 It essentially gives you an overview of your code, and navigates to sections you click on. Take for instance the piece of code we had earlier, if you open the file, and go to the Outline section on the left pane, you&apos;ll see this We see an outline of the main blocks of our code, and clicking on any of them, takes the editor focus to that section of the code. Most of the time when running code, there&apos;s usually a terminal open either to the side, or somewhere in your machine. Settings - The most common settings plugin is called Settings Sync, and allows you to sync your VS Code installations on different devices. Docker - Developing with Docker can sometimes mean running complex docker commands, and monitoring things. Installing this Docker Extensions adds some helpful docker tools, such as generating docker files, docker files intellisense, and even monitoring. Here&apos;s an example of my running containers in VS Code right now. Also comes with a useful context menu. If you are familiar with docker, you&apos;ll find this plugin quite helpful. NPM - I&apos;ve already explained the inbuilt npm tools above. Here are a few plugins that make my npm work easier. Version Lense - Easily manage versions of your npm packages. Import Cost - Easily see the bytes every package import brings in your codebase. Markdown All in One - this allows you to edit markdown as though you were writing a word document, and many other features. Useful if you write a lot of markdown. Angular Essentials - For Angular Developers. React developers, please leave a comment, I&apos;ll edit the article ;-).